Definition: Product life cycle (PLC) is the cycle through which every product goes through from introduction to withdrawal or eventual demise. Products have a limited life . Products require different marketing, financial, manufacturing, purchasing, and human resource strategies in each life cycle stage. In this stage the product is new and the customer acceptance is low and hence the sales are low. Knowledge of the product and its capabilities reaches to a growing number of customers. The product is widely acceptable and sales are now stable, and it grows with the same rate as the economy as a whole grows. At some point of time the product enters the decline stage. Its sales start decreasing because of a new and a better product has entered the market to fulfill the same customer requirements. Nokia is a Finland based multinational company which was introduced during the year 1865 by Fredrik Idestam. Not many of us know this but Nokia started by producing cables, pulp and rubber. In 1992, Nokia launched it’s Digi-handheld GSM phone, Nokia 1011. It didn’t provide or launched a variety of models due to it’s less demand and sale. Nokia sold both GSM as well as CDMA phones. After a lot of research Nokia then launched it’s first phone without an antenna, Nokia 3210 on March 18, 1999. With more than 160 million units sold this model is one of the most popular and successful phones in history. When I-phone and Samsung came in competition, Nokia then launched phones like N95 to compete with them. During this stage, Nokia launched a lot of touch screen models, one of which was N-97 qwerty+touch which was huge success and the most profit was gained. Nokia’s poor product design and having it’s main focus on Windows as it’s OS, lead to it’s decline. 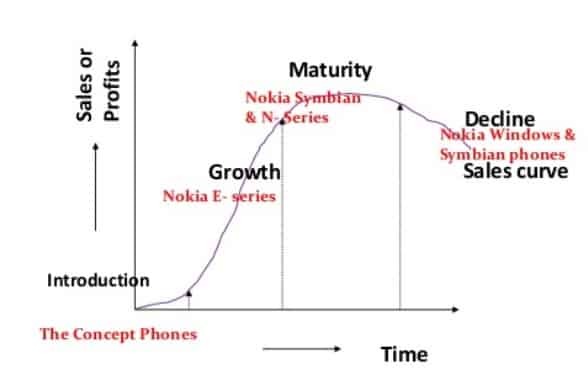 Nokia is going through this stage now.